I am sure that many of you are watching the Olympics just like me. I started off not really that excited about it, in fact I didn’t even bother to watch the opening ceremonies. Of course with athletes like Michael Phelps and Dara Torres winning medals, how can you not watch? 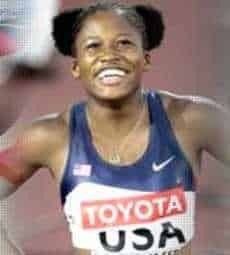 Last night I was watching Lauryn Williams in the women’s 100-meter dash final just missing a medal by taking fourth place. She had won the silver medal in Athens. I didn’t realize that she was so small at only 5 foot 3 inches. For a tiny girl, she sure can run. Williams lost the gold to the Jamaicans by only .2 seconds. “I was definitely hoping to be in the mix,” Williams, 24, said. “I felt good going into the final. I had no reason to believe that I wasn’t one of the people contending for gold. I got on that line to win. Congratulations Lauryn, I wish you luck when you run for the 400 relay team this Friday.